Oh the rain and the darkness and the wind make for fine companions. Another dismal forecast was in store. 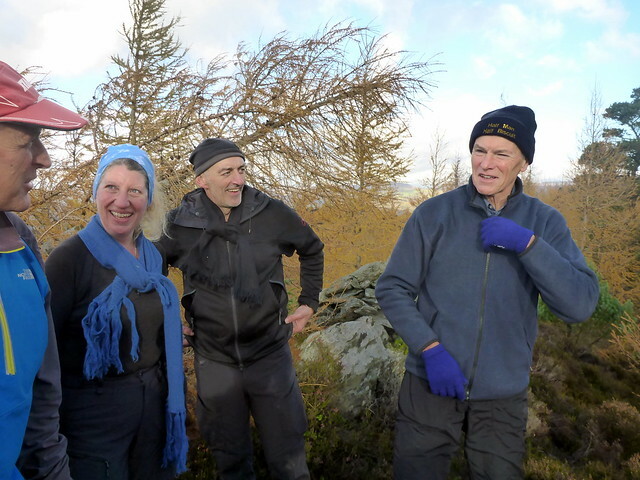 We had agreed to go along to Scoob & Fi's induction into MARHOF on Saturday, when they were climbing their 600th - Newtyle Hill, right beside their house. 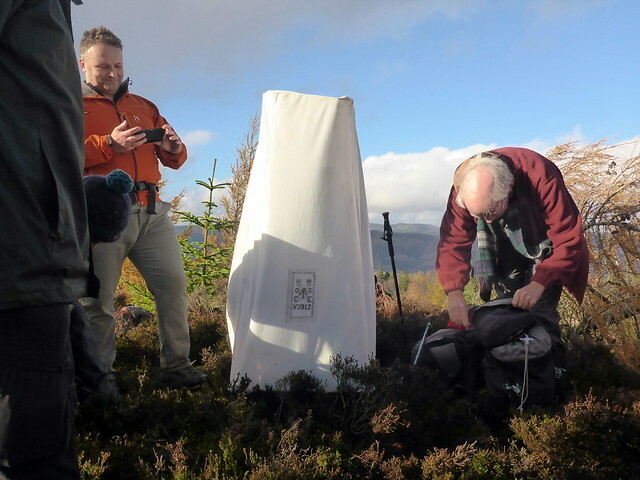 A group of Relative Hills luminaries were turning up, so not one to miss. 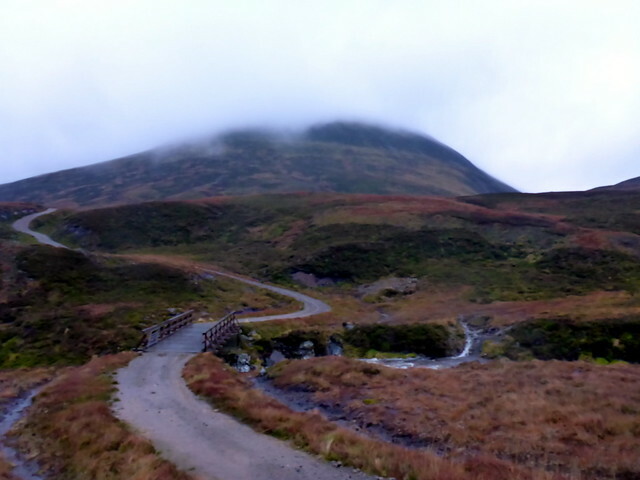 That left us with a choice of hills somewhere around Dunkeld for Friday - we ended up agreeing on the Drumochter four, then maybe Meall Corranaich & Meall a'Choire Liath on Sunday. Very slow traffic through Glasgow on Thursday night meant that we didn't arrive at our camping spot just off the A9 at Drumochter til 8pm. It had been a miserable drive up - wind and heavy rain. 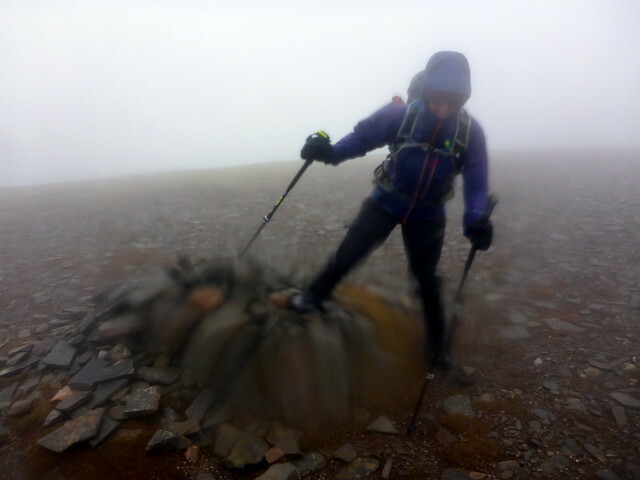 I sat in the car with the rain drumming on the windscreen, being shoogled by a passing juggernaut every few seconds, knowing we had to take the tent out and down the embankment and pitch it in the dark. Sometimes it would be nice to have a camper van Anyhow, we did eventually stir ourselves to brave the elements, including the spray from passing vehicles and got the tent pitched in our usual spot, huddling out of the elements. After something hot to eat and getting into bed it didn't seem so bad and I slept fairly well. Forecast for Friday had been for rain and stormy winds of at least 50mph. It might not be pleasant on the Drumochter 4 but at least we were unlikely to get blown off an edge. We were adding in the Sow of Atholl as the weekly Corbett - last time we'd climbed it we'd crossed the river just after the railway tunnel, but with heavy rain overnight this was not an option today. 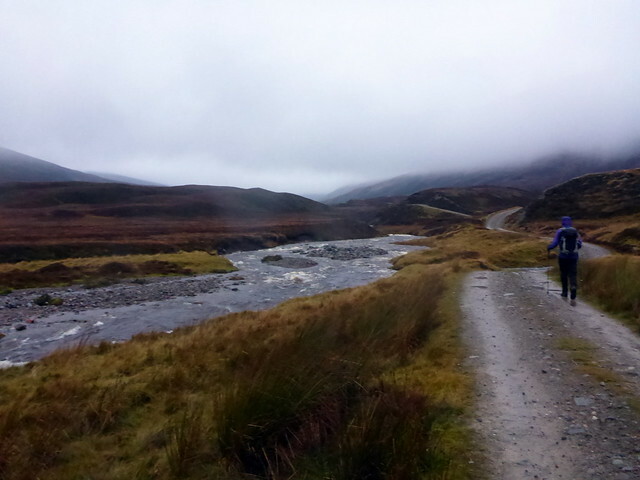 In fact the wee stream that needs to be crossed on the track was a bit of a torrent in itself. We continued on down the track til we came to a bridge that takes a track up to some gross butts on The Sow - the track goes a fair way up the hillside and it was straightforward enough to get to the summit. 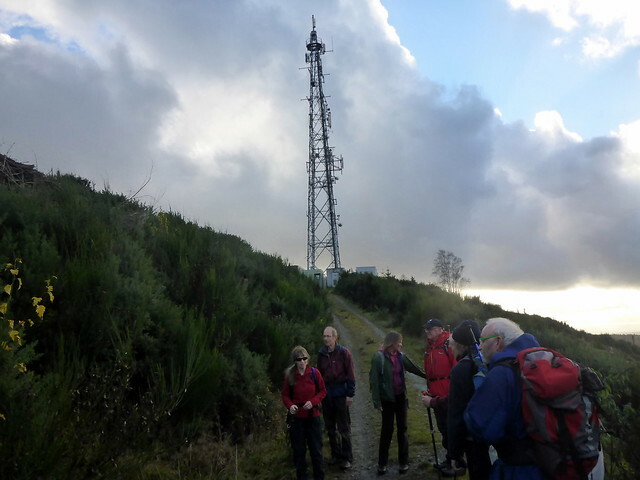 We'd been protected from the southerly wind blasts by coming up the northern side of the hill - from here on it we were exposed to much buffeting. Down to the bealach with Sgairneach Mhor and picked up a path to the summit of our first Munro of the day. From here a boggy section to Beinn Udlamain, probably easier done in this direction than in reverse (as we've done on previous occasions). 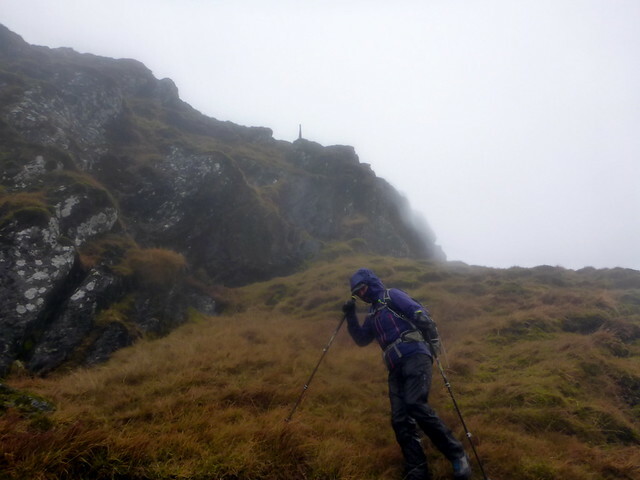 The wind between Uldamain and A'Mharconaich was the worst of the day - very difficult to stand against it. Goggles were utilized to stop it ripping out our eyeballs - breathing was difficult and I could feel it actually blasting into my nasal sinuses. 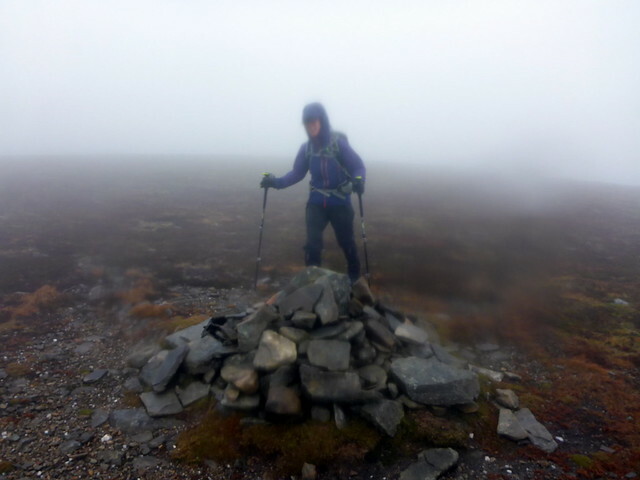 A little respite ascending A'Mharconaich then more torment as we headed across to Geal Charn. 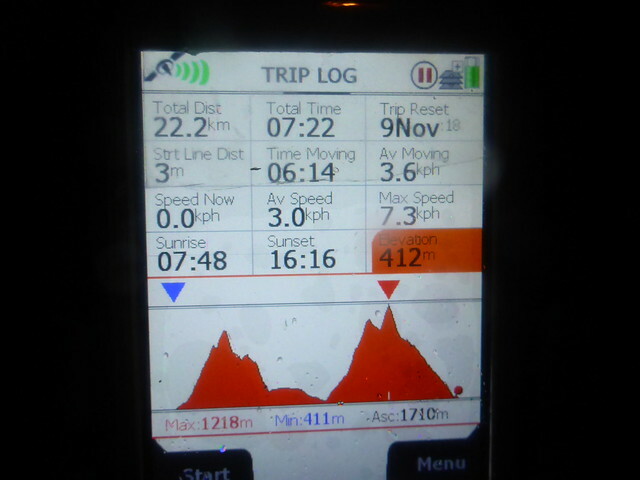 The descent from the last hill was again largely protected from the wind. 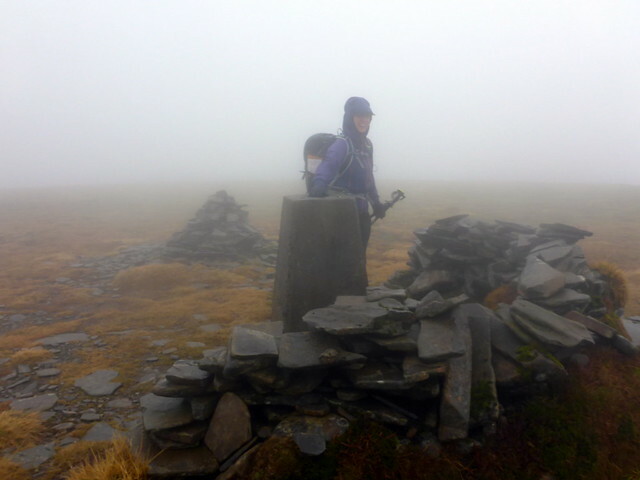 We also came out from the clag that had dogged us all day as we descended. A tramp back along the road and we were done. 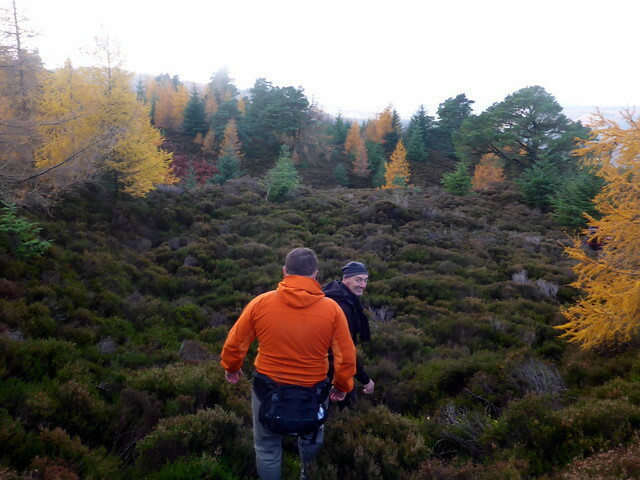 Drove down to Dunkeld and met up with Scoob and Fi, who'd kindly offered to put us up for the night. I was struggling with blocked/inflamed sinuses from the battering they'd taken from the wind and had a nose that was running like a tap. We were meeting up for a pint with Rick Salter who'd come up with Jenny for the MARHOF do - good to see him again. 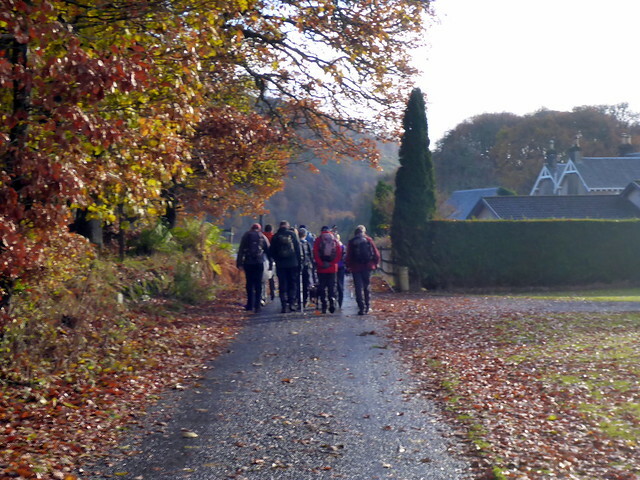 Our motley crew, replete with a couple of canines, set off along the streets of Dunkeld, past the community farm and up the hill-path towards the transmitter. I didn't take my GPS, so I am not entirely sure what the route was - but it did involve mingling through the trees and climbing a deer fence - not an easy task if you are a young black Labrador The summit was reached, photos were taken then came the events that made Mr Biggles comment that this had been the most surreal day of his life: chanting of the MARHOF song; the erection of a "porta-trig" (for hills that don't have a trig point of their own) which contained Charles Everett and at one point had a spaniel then a toy dragon perched upon it; then the measuring of the hill's height by Alan Dawson (along with some hot-off-the-press news about a Donald which will be confirmed to an unsuspecting world later this month). Whisky and champagne flowed, much merriment was had as the newest occupants of the Marilyn Hall of Fame were inducted. I thoroughly enjoyed chatting with Bert Barnett, who was a delight. Mr Biggles with the "porta-trig"
A different route, not involving deer fences, was taken on the descent - unfortunately, this involved very soggy rough ground instead. 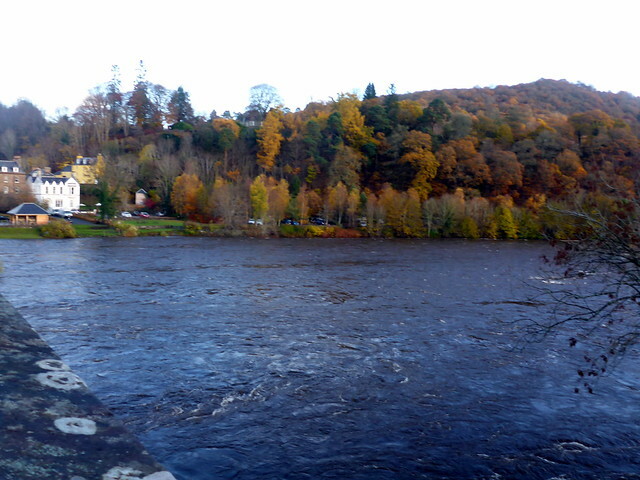 Returning to Dunkeld some went for a pint in the Tay Bank whilst we headed down to Perth as I had some business to attend to there. I was still feeling pretty wretched, although the fresh air had helped the sinuses to some extent, but I just wanted some sleep. After looking at Sunday's forecast for rain, fog and sleet we had a rethink about the hill choice and decided to head to Comrie Croft, where at least we could camp in comfort. The rain started before we arrived, so once again it was pitch in the rain. I had been looking forward to a hot shower, but the heaviness of the rain drumming on the tent dissuaded me from that - we just had our meal and got into bed. It rained most of the night, but I slept fairly well and felt rested by morning - whether this had anything to do with Allison's suggestion of rubbing Tiger Balm on the soles of my feet, I don't know. What would we do? Well, maybe Meall nan Tarmachan, along with a Simm to its north? Sounded alright. We drove along to the Ben Lawers car park, which had various men in camouflage kilts wandering about (there was a tent village down the back of the car park). 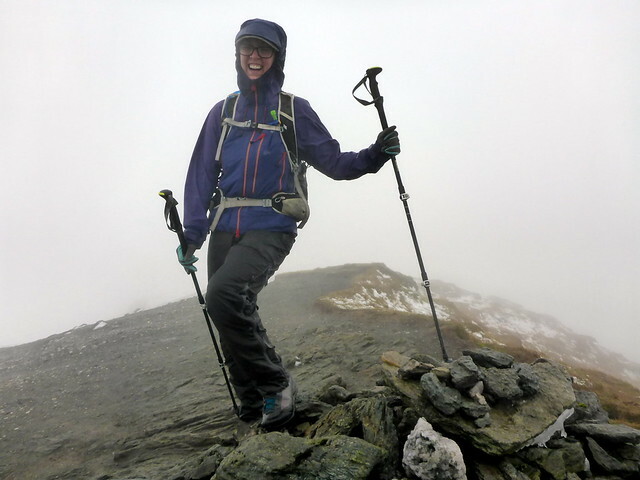 Geared up and set off in mist for Meall nan Tarmachan - my route would mean heading to the summit then continuing NE to the Simm of Creag an Lochain. Lot of pathwork going on - although the existing path isn't really that bad, I can think of a lot of hills with worse approaches. 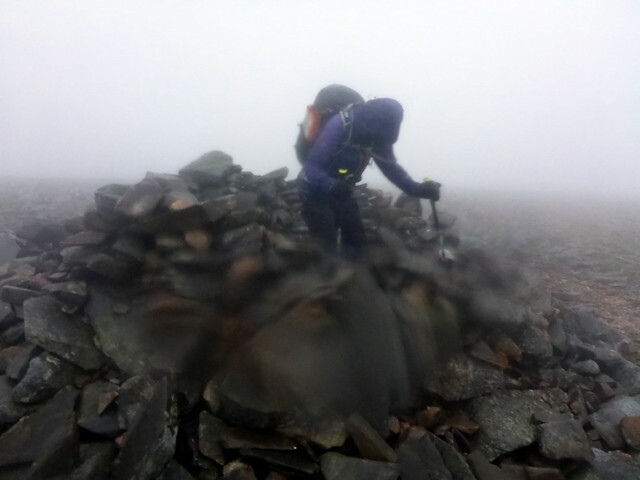 We were enveloped in fog around 600m and made our way to the summit, meeting a couple of guys coming down. 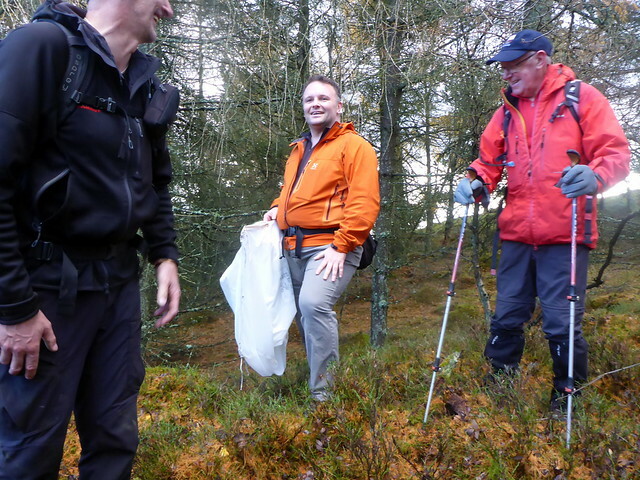 One spoke of how disappointed he was in the weather, it was the fourth time he'd been out in the hills this year in these conditions. We just smiled, thinking to ourselves "you need to get out more, mate"
Got to the summit then headed down the NE slopes, steep and snowy at first. 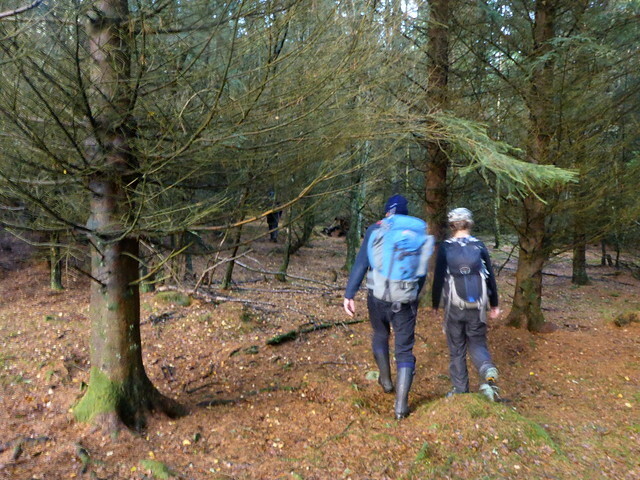 We picked up a fence post line lower down which we followed for the rest of the walk. Very slender fenceposts - in fact sometimes they became so slender that they were actually invisible, so we were at times following an imaginary fenceline. On a couple of occasions the fenceposts came to a crag edge - usually fence post lines take the path of least resistance down a slope, but these just stopped in mid air, with a drop of 30-40 feet to the next post. Be warned! We made it to the Simm, where our old post line had been augmented by a new electric deer fence. This runs down the top of the crags overhanging Lochan na Lairige and ultimately joins with the road, which we followed for about 4km back to the car park. It was just after 2pm - far too early to go home. Besides, Bod had invited me and Allison into a Fitbit Weekend Challenge, so the more steps the merrier! Why not just nip up Ben Lawers while we're here? 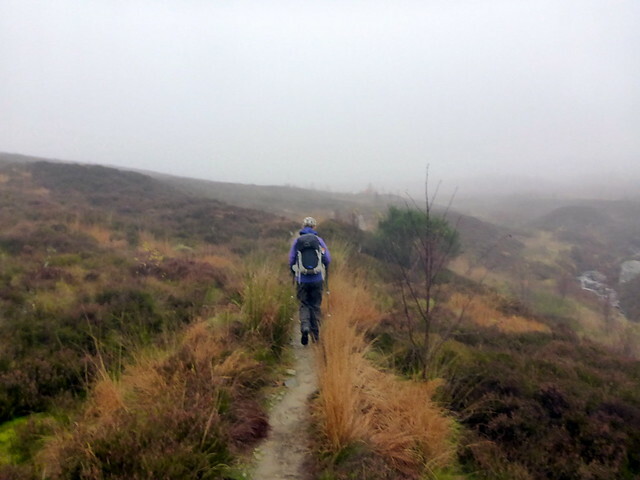 Allison didn't seem especially enamoured with my idea, but gamely set off at a good pace up the path. We passed another couple who were also heading up - clearly crazy people I reckoned it would take us about 3.5 hours, which meant we'd be coming back in the dark, but with a good path I couldn't see any difficulties with that. Some path improvements here too, with sections of planking over boggy areas. 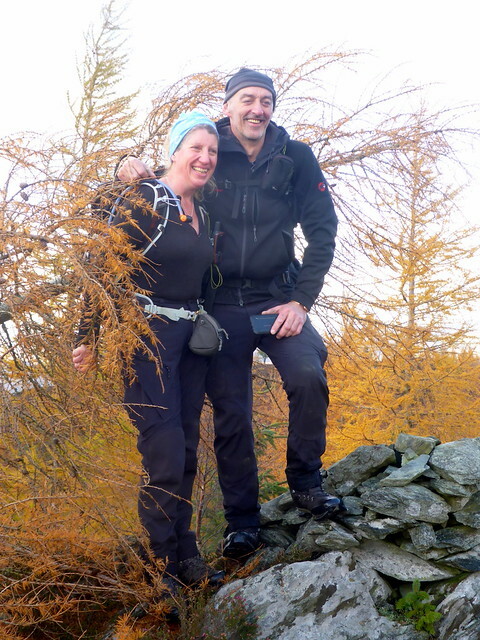 I remembered Beinn Ghlas as a smallish bump on the way to Lawers - however the ascent seemed to be taking a long time and I refreshed my memory with a look at the map - 1103m!! Not an insignificant hill. Nearing the top we met a woman with a fine collie who asked us "the headtorch question" when she learned we were going on to Lawers. 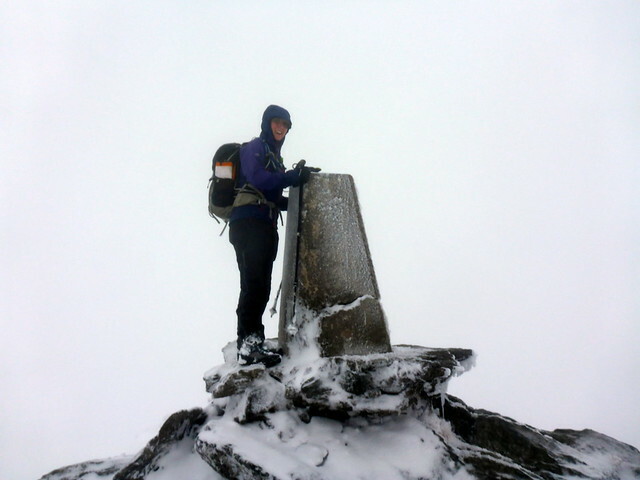 Finally summited Ghlas, amidst light snow and pressed on to Lawers. 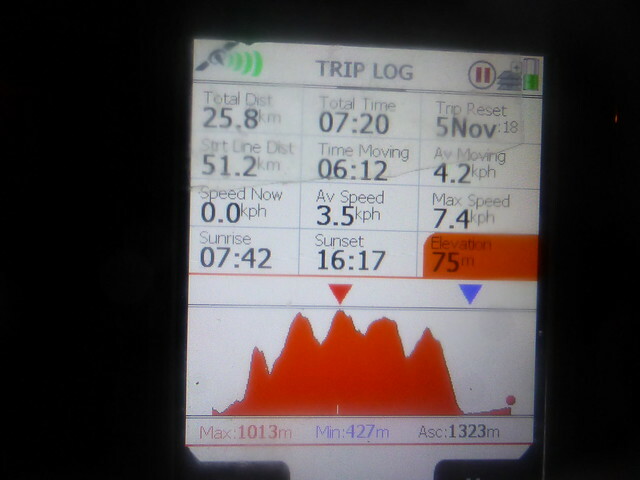 I reckoned it would take us 30 mins from Ghlas to Lawers, meaning we'd arrived there just after 4pm. 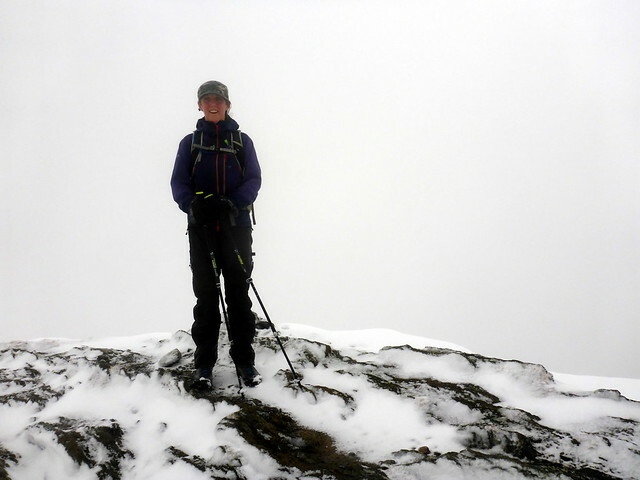 That turned out to be fairly accurate, despite a heavy coating of snow, a foot deep in places, on the way up Lawers. And it felt really cold. 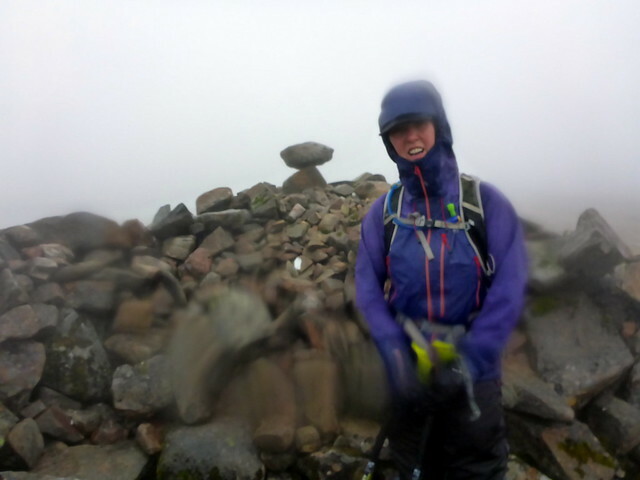 Summit reached, descent to the bealach, a hurried bag of crisps for energy and get the headtorches handy. We elected to take the bypass route round the northern side of Ghlas and about halfway along this we did need t power up the lights - a mixture of fog and rain befouling the night air. I quite like walking by headtorch - at least if on a reasonable track. Tiny moths flew in and out of the beam, the raindrops glistened like diamonds and the stumbling was kept to a minimum. Made the car by 5.40pm and had a dark drive back down the road, gradually thawing out after our adventures. Great reflection of an awesome day on Saturday Al! 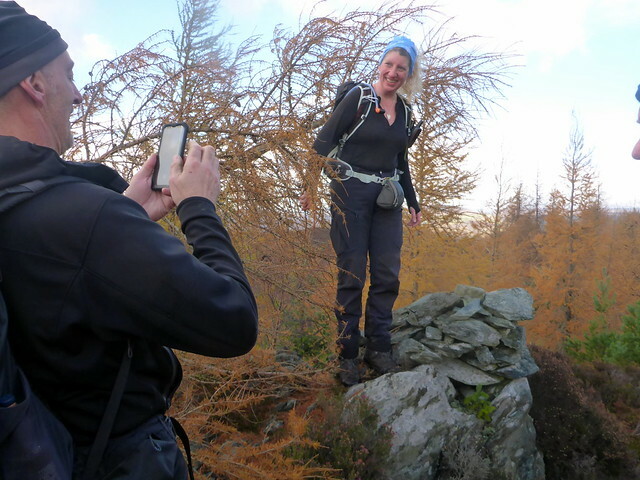 Such fun adventures on the wee hills too Glad you were feeling a bit better the day after; look after yourself!